While my week at the beach progresses, I’m hoping to channel my sun-soaked energy to my BAMF Style friends and readers with another post featuring classic summer style for a day in the sand and sun. The film adaptation of Revolutionary Road, Richard Yates’ 1961 tribute to suburban disillusionment, reunited Titanic stars Leonardo DiCaprio and Kate Winslet as the semi-happily married Frank and April Wheeler who find themselves increasingly disgusted with their lives in the Connecticut suburbs. A day at the beach is anything but when the bickering Wheelers accompany their friends Shep (David Harbour) and Milly (Kathryn Hahn) to Sasco Beach in nearby Fairfield. 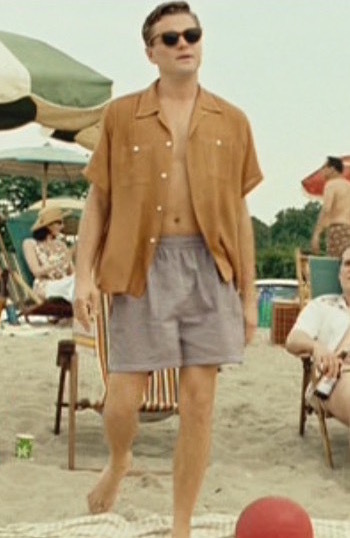 Frank’s wears a copper camp shirt made from lightweight linen or a linen-blend that keeps him cool and airy while in the sun and in the heat of an argument with April that night. The short-sleeved shirt has a one-piece camp collar, four white plastic or mother-of-pearl buttons down the plain front, and two patch pockets on the chest that each close through a single button. Frank wears pink-on-purple striped shorts made from puckered cotton, similar to seersucker. These shorts have a large, baggy fit that appears to be emphasized with pleats on each side that extend down from the elasticized waistband. Strong sunglasses are a must-have for a day at the beach, especially if you want to hide your eyes when arguing with your significant other. Frank wears a pair of orange tortoise-framed wayfarer-style shades with dark lenses. When he takes them off, he clips them into the left chest pocket of his shirt, proving the utility of wearing a shirt with multiple pockets on a hot day that doesn’t require a jacket. Passive-aggressive marital spats at the water’s edge. When we catch up with Frank and April for a contentious evening at home, he is wearing the same shirt but has changed into a pair of large-fitting khaki trousers and navy canvas deck sneakers that he likely changed into when driving back from the beach. Not much is seen of the trousers due to the untucked shirt hem, but they are likely pleated and they have plain-hemmed bottoms. The navy canvas shoes have three eyelets for the white laces and thick white rubber outsoles. An uncomfortable night at home. Frank doesn’t wear his watch, but he still wears his gold wedding band on the third finger of his left hand. Frank and Shep both enjoy beach beers in the form of bottled Budweiser. A good time was had by… some? Frank Wheeler makes comfort a priority for a day of beach-bumming, suburban dad style. Check out the movie and read Richard Yates’ original 1961 novel.